BLANTYRE, Jan 11 2010 (IPS) - Let the rains fail, even for several successive seasons, and Malawi should still be able to produce enough to feed itself. This is the motivation for the country’s green belt concept. It is strengthened by painful memories of the severe drought beginning early 2002 which triggered three years of hunger. By 2005, five million people were affected by famine, all while large quantities of water flowed out of the country to the oceans of the world. Local agriculture experts explain that two districts in the southern tip of the country could feed the entire country all year round if the Shire River, which cuts through the length of this southern plain, was utilised for intensive irrigation farming. Yet, the two districts, often troubled by floods, are among the most desperately poor in Malawi, and their inhabitants survive on food handouts from government and donors. 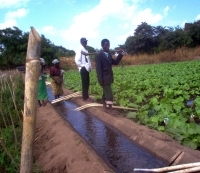 The programme seeks to make Malawi independent of rain-fed agriculture. For all the much-publicised success of subsidies for small-scale farmers over the past four years, Malawi must also thank good rains for the increased production. The plan is to protect the gains in food security, reduce vulnerability to drought and to boost production still further by irrigating a million hectares of land in a swathe lying within 20 kilometres of the country’s three lakes and 13 perennial rivers. Last season, Malawi produced 3.5 million tonnes of maize, the country’s staple crop. This is 1.1 million tonnes more than the country’s total annual consumption. Of the total harvest, only 300,000 tonnes came from irrigation farming. Invitation of foreigners into the programme has often stirred criticism from organisations such as the Civil Society Agriculture Network (Cisanet) who argue that government is fuelling foreigner land grab at the expense of the welfare of locals. "We need to be cautious on this one. It brings no harm to have foreigners in the programme as long as they are not coming to grab land and displace local people," says Cisanet national coordinator Victor Mhoni. Mhoni argues that promises of job creation and forex earnings for Malawi through foreign investment should not substitute the need for policies that would grow domestic investment. "If we allow foreigners to grab land in the belt, we will lose out on the market because they will be producing what they need for their countries instead of us producing what they would need and sell it to them," he says. But Mauwa is quick to allay fears of a land grab in the programme. "That land is for Malawians. Those people that are there are the ones to be working on the schemes. But we need others to help us in financial, material and technical terms," she said. Irrigation agriculture is presently practiced on just a third of the one million hectares of land earmarked for the green belt programme. The plan will also attempt to diversify crops, targeting increased production of wheat, rice, millet, cotton, lentils and beans for export. The Lake Malawi-Shire River stretch is the most important in the project. A section of the East African Rift Valley, the watercourse extends a thousand kilometres from the head to the toes of Malawi – from the northernmost point to the southernmost one. Apart from identifying new sites for irrigation, development of the belt will also include restoring infrastructure that has fallen into disuse. In February 2009, government invited bids from construction companies to establish, rehabilitate and manage 12 irrigation schemes as part of the programme. But what about issues of land, probably one of the most delicate factors in the implementation of the programme? Much of the land in the designated belt is customary. The deputy minister for agriculture and food security, Margaret Mauwa, says government will not expropriate land. “Our interest is particularly on small scale farmers. We will be grouping them and we believe that will help to deal with the problem of land holding through creation of ownership of the irrigations schemes,” says Mauwa. Through their organisations, the farmers will be encouraged to apply for a lease of the customary land. Alternatively, the farmers may apply to register the land as private land owned by a group of farmers, says the irrigation bill. During his visits to Brazil and the U.S. in September 2009, president Bingu wa Mutharika invited foreign investors to come to Malawi to participate in the implementation of the project. Government will bear the cost of establishing or rehabilitating the schemes prior to turnover. Thereafter, all operations, maintenance and replacement costs in the schemes are to be managed by the farmers themselves. “The overall policy for financing irrigation development is that it occurs with minimum government subsidy,” reads the national irrigation document. The schemes will be located on public land and government will then hand them over to legally recognised small holder irrigation farmers’ groups, preferably cooperatives or associations. But government will not totally separate itself from the activities in the schemes. Apart from providing agricultural advisors, government will also explore ways of securing credit for farmers through the establishment and growth of savings and credit cooperatives and village banks. The Civil Society Agricultural Network (Cisanet) says the green belt project could be a lasting support for Malawi’s fragile economy. However, Cisanet is worried about marketing. The agricultural boom of the past four years has exposed problems for farmers seeking markets for their produce. Although government has set the prices at which traders should buy farm produce, crops such as tobacco, maize and cotton have failed on the market, leading to some farmers to decide not to grow the crops this season. Speaking in an interview with IPS after Mutharika was awarded the 2009 Driver of Change Award, Professor Richard Mkandawire, head of agriculture at the New Partnership for Africa Development, said where subsidies have been applied for small scale farmers, the farmers have not had adequate access to markets. Bumper harvests have not led in a straight line to reducing poverty. “Fertiliser and seed subsidies that have over the years been extended to small scale farmers have failed to take them into a market economy. Rather, the subsidies have simply cushioned their poverty. There is a clear danger of simply patronising poverty instead of reducing it,” he said. Mauwa admits Malawi struggles with markets but she says the construction of the green belt programme has taken on board economic experts from the private sector and from the departments of transport and trade to develop a relevant plan. Q&A: "Between Implementation and Planning, There Is a Disconnect"
She says government is evaluating setting up marketing and processing Boards. The boards could initially be established by government but later privatised. On the other hand, the department of irrigation will be providing farmers with training in how to effectively negotiate better prices for agricultural commodities. The ministry will also encourage larger estate farms to assume a coordinating role in storage, processing and marketing of farm produce.